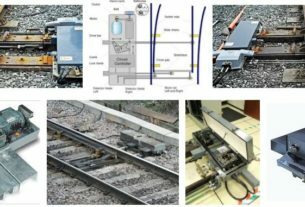 Relay Interlocking is a system of implementing principles of interlocking for safe train operations at a Station with the help of electrical circuits wired through electro-magnetic relay contacts and coils. In Route setting type popularly known as RRI in Indian Railways (IR), no individual points need to be set. Only the route controlled by a Signal has to be initiated by pressing Entrance Button (or) Operating Entrance knob (located at the foot of the Signal on the Operating Panel) and pressing the Exit Button on the operating panel located on the track on which a Train will be received. In Non-route Setting type, the individual points have to be operated from the Panel by turning the Point Knob to Normal (or) Reverse as the case may be (or) pressing the Individual Point Button of the concerned Point and a Common Point Button. Then the Signal will have to be cleared by turning the Signal Knob (or) pressing the Signal Button and the Route Button. What are the two major philosophies for Relay based interlocking used in Indian Railways? This uses metal to carbon contact plug in relays known popularly as Q-style relays. The Second system uses metal to metal contact relays popularly known as K-50 relays. This practice is followed in many European countries. M/s. Siemens introduced this technology in Indian Railways. What is the basic difference in the Design Approach of the two Systems i.e., one which uses Q-series Relays and another which uses K-50 relays? Since the relay contacts make or break current when they are closed or open, there is a possibility of metal to metal contacts getting fused or welded due to the arcing that takes place. When the make or break takes place, it is possible that even though the power supply to the coil of the relay is cut off and the relay is de-energized, due to the welding of contacts which were made during the energisation, de-energisation of the relay coil may not break the contacts. Hence, in the metal to metal contact relay design, every relay has to be proved for the back contact availability (De-energized Contact). Otherwise, the energized contact which is used for controlling vital operations like signalling gears may continue to be available, even though the conditions for that vital function to be operated are not fulfilled and power supply to the relay is cut off. In the metal to metal carbon contact relays because of the dissimilar material of the contacts, the possibility of fusing or welding is ruled out. Hence, this back contact proving is not required for every relay. This panel shows the miniature lay out of the yard with controlling knobs/buttons for operating various functions mounted on the panel. This also gives indications about the status of the functions i.e., Points, Signals, Routes, Gate Control, Track Circuits, etc. This panel is operated by the Station Master who is in-charge of the Train Operations at that Station. This consists of racks which are wired and on which the relays are mounted. This is the interlocking Centre of the Station. This relay room on one side is connected to the panel to receive commands from the panel for operation of the functions and also to give indication to the panel to show the status of the functions which are controlled by the interlocking. On the other side, this relay interlocking takes inputs from the field like position of signals, points, track circuits, etc., and gives output to outdoor functions to drive them. This is for connecting the different sources of power i.e., Traction, Commercial Supply, Generator Supply, etc. 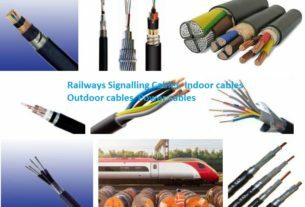 Since controls originate from relay room and go to the outside functions like Points & Signals and their status are repeated to relay room, signalling cables are laid from the Relay Room to the functions. * To ensure that any Signalling gear is operated only by an authorized person, the panel has got a locking arrangement. The key is with the ASM on Duty. When he leaves the panel, he has to lock the panel and take the key with him. Once the key is out, no function can be disturbed by any outsider. * To ensure that only a deliberate action by the ASM operates a signal or a point and no inadvertent placing of hand on any button will lead to the operation of the function, the operation of the panel requires both the hands. In other words in the Push Button system where an accidental placing of one hand can operate the button for any function, i.e., signal or point, two buttons are to be pressed. The buttons are so placed that with a single hand, the two buttons will not be pressed.